A usable publishing interface or control panel: Check out how the control panel looks before you commit yourself. A good user interface is important, and if you can’t make sense of what you see, chances are good that you won’t enjoy using the software. Comments: A blog isn’t a blog unless your readers can leave comments on your posts. You don’t have to use the comments, but blogging software without comments takes away a vital element of blogging — allowing your readers to cultivate discussions. Spam deterrents: Spam comments are a part of every blog, but that doesn’t mean you have to live with them. Like e-mail spam, comment spam tends to be an automated process that posts on your blog useless information and includes links to all kinds of other sites. Look for blogging software that has functionalities in place to help you moderate and block spam. Pinging: A blog software package that uses pinging services is a great idea. Pinging is an automated notification system for search engines and newsreaders, letting those services know that you’ve updated your blog. Because search engines tend to rank “fresh” content highly, letting them know when you have new content means that your blog may be more likely to appear, and appear higher, in search results. RSS feeds: If your blog software doesn’t have an RSS feed, move on to different blog software. If you’re at all interested in building traffic to your blog, an RSS feed is the single best built-in software feature that you can use to meet that goal. An RSS feed is a computer-readable version of your blog, standardized so that it can appear in newsreaders and on websites and blogs. For more information about RSS. Categories: Blogs often jump from topic to topic. Categorizing your posts gives your readers a quick and easy way to sort through your content, focusing on what most interests them. The Finer Things in Life uses categories, called topics here, to sort blog posts. Categories are high-level organizational tools. 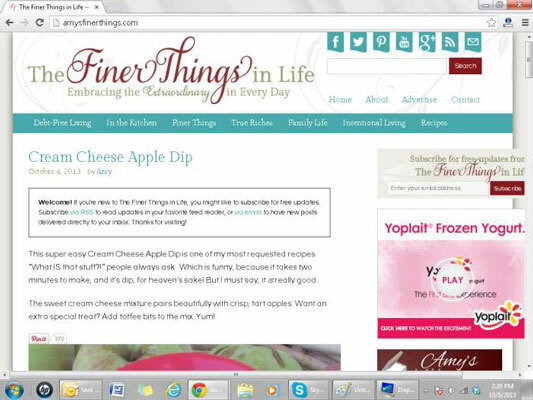 For example, a food blog might have posts sorted into categories like Vegetarian, Dessert, Main Dish, and so on. Tags: A tag is a term associated with a blog post. Tagging has proven to be one of the best ways to sort through blog data quickly. Tags are like keywords that you might use when doing a search on a search engine website, and they tend to be more specific than categories. A blog post on a food blog might use categories and then tag individual posts with more specific terms, such as chocolate, hazelnut, and brownie. To differentiate between categories and tags, think of categories as describing a group of blog posts, and tags as describing individual posts.